Lord of the Rings #4 Unofficial - Tolkien Inspired black and white fantasy linocut print, Orcs, Goblins. Lord of the Rings #1 Unofficial - Tolkien Inspired black and white fantasy linocut print, Gandalf, The Balrog. 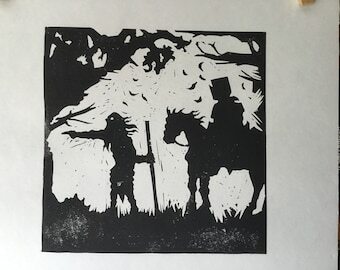 Silhouette Print - Beowulf and his men. Silhouette Print - Beowulf Struggles with Grendel's Mother. My item came very quickly and was exactly what I was expecting. Definitely worth it. This is a beautiful print. Looks wonderful in my matted frame. Received quicker than I expected. Thank you!